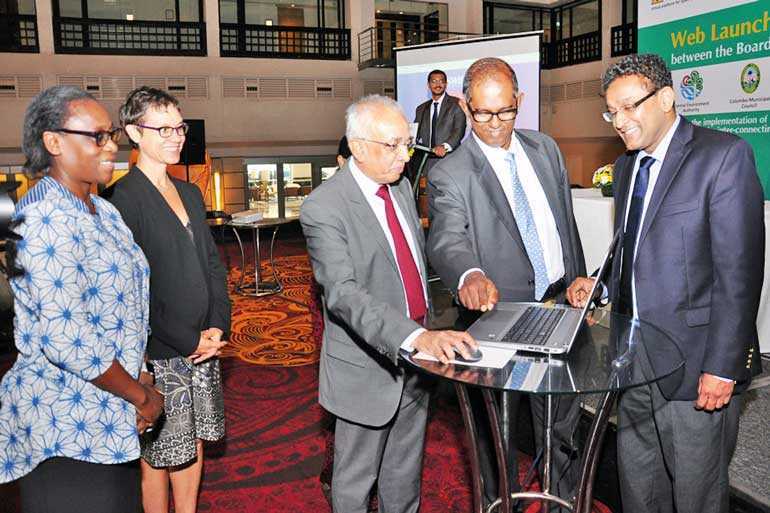 The Board of Investment of Sri Lanka (BOI) yesterday launched a web portal to streamline and fast track the investment approval process by interconnecting the first six line agencies under a single window virtual platform. BOI, the apex Government agency for promoting and facilitating both foreign and local direct investment in priority sectors, entered into four memoranda of understanding (MoUs) to setup a Single Window Investment Facilitation Taskforce (SWIFT) with the Inland Revenue Department, Registrar of Companies, Sri Lanka Customs and Urban Development Authority yesterday, while the other two line agencies, Colombo Municipal Council (CMC) and Central Environment Authority (CEA), will sign the MoU within this week. Towards the end of this year, the BOI will be extending this to 18 more line agencies and assist a total of 24, which will comprise the majority of approvals that are necessary for foreign companies planning to establish themselves in Sri Lanka. The 24 line agencies include: Sri Lanka Tourism Development Authority (SLTDA);the Geological Survey and Mines Bureau;the Immigration and Emigration Department; Municipal Council/ Local Authorities;the Coast Conservation Department (CCD);the Disaster Management Centre (DMC);the Agriculture Ministry;the Mahaveli Development Authority of Sri Lanka;the Land Commissioner General’s Department;the Forest Conservation Department;the Sri Lanka Land Reclamation and Development Corporation;the Wildlife Conservation Department;the Ceylon Electricity Board;the National Water Supply and Drainage Board;the Finance Ministry;the Defense Ministry;the Attorney General’s Department;the Import and Export Control Department; and the National Dangerous Drug Control Board. Addressing the gathering at this landmark event, Development Strategies and International Trade Minister Malik Samarawickrama said the Government’s economic agenda has been well appreciated by private investors, both foreign and local, reflecting on the projects approved and those which are in the approval pipeline of the BOI. “During the first four months of this year, the BOI has approved projects up to a value of $1.348 billion, and another $1.4 billion are in the pipeline to be approved before 30 June. Altogether, $2.75 billion worth of investments will come to Sri Lanka in the near future,” he added. The Minister expressed confidence that the Government would be in a position to surpass the set FDI target of $2.5 billion by the end of this year. Outlining that foreign direct investments (FDIs), improving local entrepreneurship and exports are the only way to get rid of the massive debts the Government inherited from the previous regime, Samarawickrama asserted it was imperative to look after the investors and the exports. He believes the launch of SWIFT will be one of the most fast-tracked systems in the region, which will give more confidence to the BOI in its efforts to facilitate and attract investments to Sri Lanka. The Minister also commended the assistance given by the World Bank and Australian Department of Foreign Affairs and Trade (DAFT) in this initiative, particularly in improving the business climate in the country. World Bank Country Director Dr.Idah Pswarayi-Riddihough listed out three wishes, which include: improvement in Ease of Doing Business ranking; attracting quality FDIs; and creation of employment for young males and females in the country. While commending the BOI and all line agencies for their dedication and mutual understanding in setting up SWIFT, she urged the BOI to keep up the effort with to strengthen the aftercare service to investors. “Let investors vote with their feet and their money,” Dr. Pswarayi-Riddihough said. DAFT Counsellor Victoria Coakley stressed the importance of reducing red tape in the investment approval process on a continuous basis. BOI Chairman Dumindra Ratnayaka said the SWIFT was launched with a view to strengthen the one-stop-shop (OSS) at BOI, simplifying the processes further by this virtual platform. “The purpose of SWIFT is to fast-track investments through a virtual OSS. I strongly believe with the SWIFT, we will be able to provide services more efficiently and transparent,” he added. BOI Director General Duminda Ariyasinghe pointed out the three objectives of SWIFT were to implement virtual platform for investor services, process simplification and increase information transparency. “It is important for us to ensure the investment approval process happens in the most customer investor friendly manner. The six agencies have already committed for service delivery, and we will have a traffic light system to monitor the lapses on our part,” he stated. In addition, he said an Investment Facilitation Unit Chaired by National Policies and Economic Affairs Ministry Advisor R. Paskaralingam will monitor the progress of these agencies on a regular basis, while there is a high-level Single Window Investment Approval Committee chaired by Treasury Secretary Dr. R.H.S. Samaratunga closely observing the performance of the system. The MoUs were signed by BOI Director General Duminda Ariyasinghe with the representatives of the four agencies.